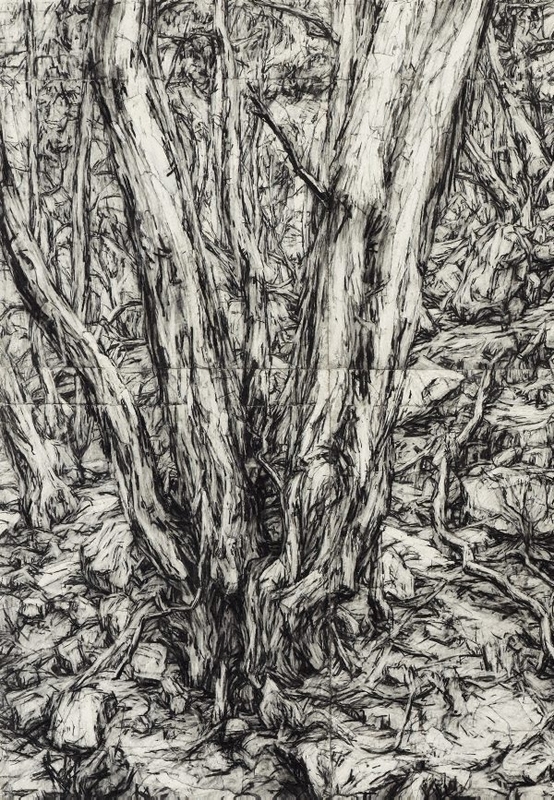 This drawing was made over a period of several months in late 2000 and early 2001, when Tonkin began drawing at Werribee Gorge, near Melbourne. Its subject is an outcrop of rocks at the end of a ridge. 'It is a dry landscape, stunted red and yellow box gums twist their way out of rocky ridges and are laden with dollops of mistletoe in the gullies. Its great attraction was that it is such an intimate landscape. The canopy is very low, and there is very little undergrowth – allowing a clear look in to deeper space … I felt that I wanted to make work about the experience of being immersed in the land (Mary Tonkin, 2002)'. Working from the centre of the composition, Tonkin added more sheets of paper as the drawing demanded. The drawing comprises ten parts, with additions at top and bottom as well as collage additions made to the surface as part of a ‘correcting process’. This work won the Dobell Prize for Drawing in 2002 and was acquired by the Gallery in 2002. Signed and dated u.r. corner verso, pencil "... 2000/ .../ Mary Tonkin/ ...". Paul Gray, Herald Sun (Australia) , 'Drawn to success', pg. 92, Port Melbourne, 17 Jun 2002, 92 (illus.). Hendrik Kolenberg, Look , 'Drawing a winner: a decade of Dobell prizes shows us how and why', pg. 24-27, Sydney, Aug 2003, 24-25 (illus.). Hendrik Kolenberg, Contemporary Australian Drawing: 20 years of the Dobell Prize for Drawing , 'Introduction', pg. 6-14, Sydney, 2012, 7, 38, 39 (illus. ), 61. Hendrik Kolenberg, The Dobell Prize for Drawing: 1993-2004 , ‘Introduction: the first ten years’, pg. 8-9, Sydney, 2004, 6–7 (illus. ), 9, 34, 35 (illus. ), 50, 53. Inga Walton., Artist Profile , 'Judgment calls: Mary Tonkin at the NGV', pg. 106-109, St Leonards, Aug 2013, 107 (illus. ), 108, 109. Kit Wise, Artlink, vol.25, no.2 , 'Australian drawing now: labouring lightly', pg. 34-39, Adelaide, Mar 2005, 36.